The ST8 Balin Stone colour is a classic, with smooth overtones and grains of beiges giving that porous look. With the 12" x 12" tile you are getting the the full benefit of openness and space, and with the full weight of the Karndean guarantees. 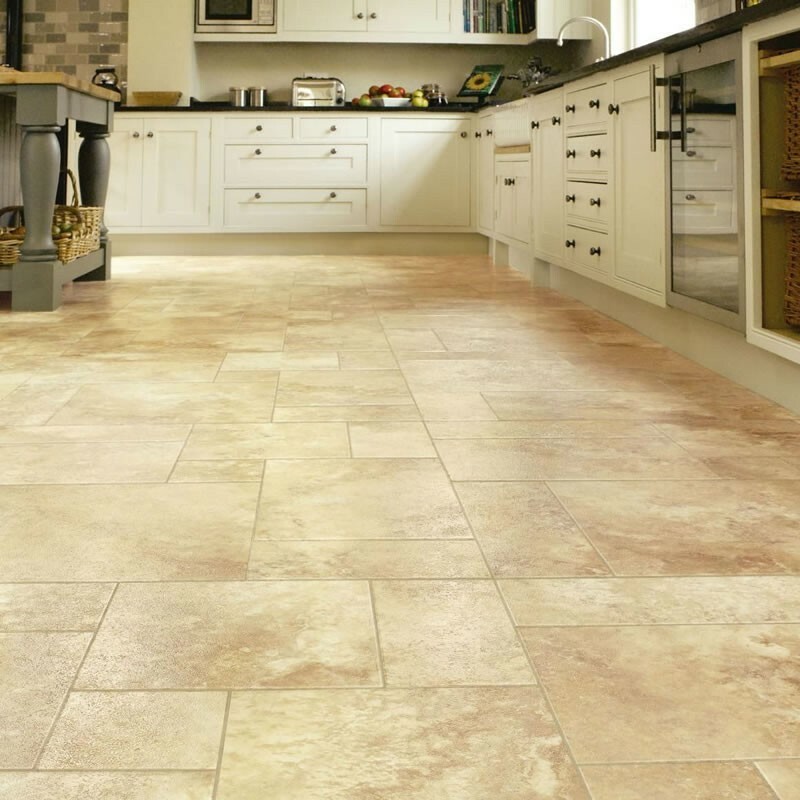 The TT34 Sandstone is a real winner if you are after that warm travertine feel to your home. 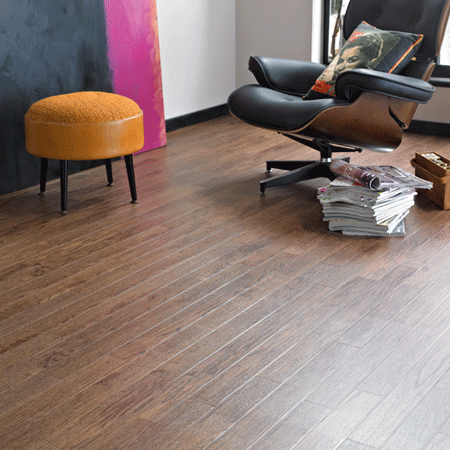 With rustic sand tones and a chocolate feature strip to compliment the floor its a real winner for that Spanish feel. All with long guarantees for that piece of mind. The ST9 Linton Stone is a sandy looking tile with a mottled effect of beiges and splashes of grey. 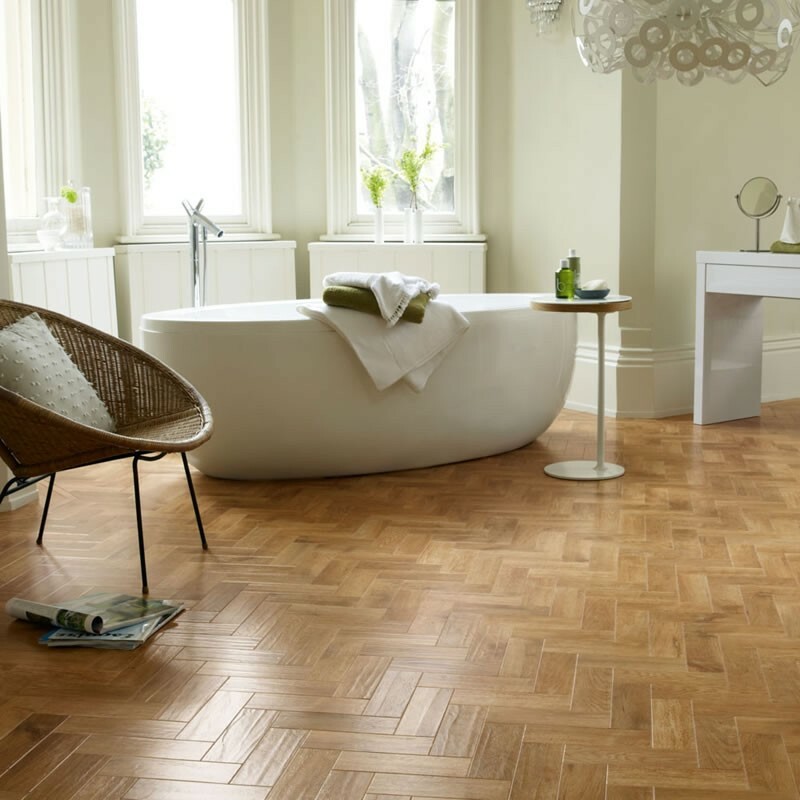 Add the grouting strips to get that real finish to your floor. Go to the sampling room and request a sample today. The classic marble of the T90 Carrara Marble is an iconic statement from Karndean with the rich greys and beiges giving a warm feeling any room. With the 0.3mm wear layer and a slip resistant of R9 rating this really is a winner to any wet room. The ST10 Damas Stone is a classic tone of beige with light and dark grains running through the tile, with a dark grouting strip it gives you that perfect finish. A wear layer of 0.3mm and a 12 year guarantee, giving you peace of mind. The creamy colour of the T98 Cara Marble is a blend of sandy beiges with grains of a biscuit tone with the compliments of feature strips to create a perfect floor. With a commerical guarantee of 6 years this colour is proving very popular. SP212 Terra is a large rectangle tile(18"x24") with a travertine look with a mixture of light and dark tones. It is one of the best sellers out of the opus range. All with the compliments of a 15 year gurantee. This SP112 Solis is a fresh look with a warm glow of sunshine with the 3mm feature strips it really does show off the range. This range is truly a refreshing colour giving you warmth and space to any room in the house. SP111 Luna is a lovely large stone effect tile with white overtones creating a clean look with 18"x18" tiles creating a spacious feel to any room in your home. LST03 Piazza Limestone is a soft beige tone with a graining of blues and greys flowing through the tile to give that real authentic look and feel of a ceramic tile. Why not browse through the grouting strips to get that real feel of a Mediterranean tile. The SS6 Cotswold Stone is one of the best sellers in the Da Vinci range with its warm tones of sand and with a pinky rich tone, it really is a classic. 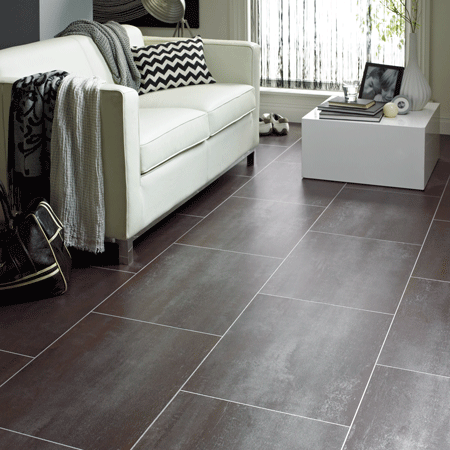 Why not choose from a grouting strip of dark tones to really enhance the floor. 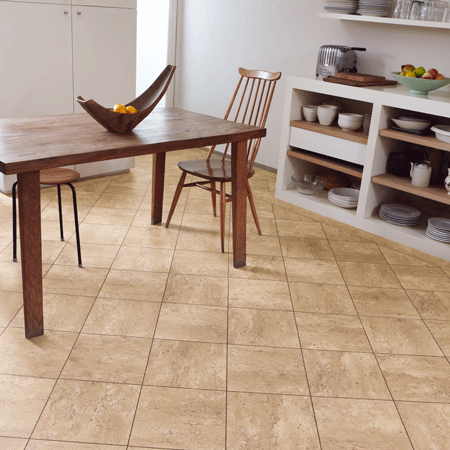 The LST02 Sienna Limestone is a slightly darker tone than the limestone with a creamy background and mottled grains of a sand running through the tile. 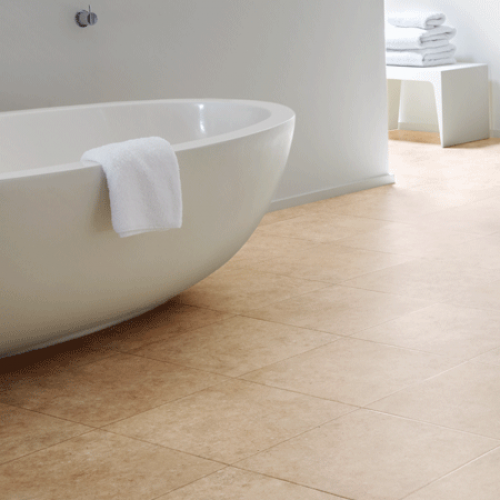 Giving you a warm feel of a ceramic tile with no coldness attached to it. 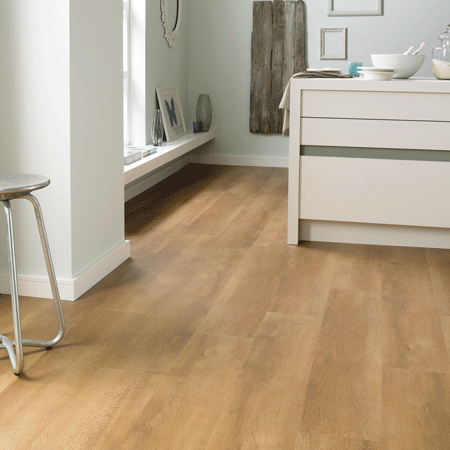 CC04 Alabaster Ceramic offers an attractive looking flooring with the usual quality that you associate with Karndean. 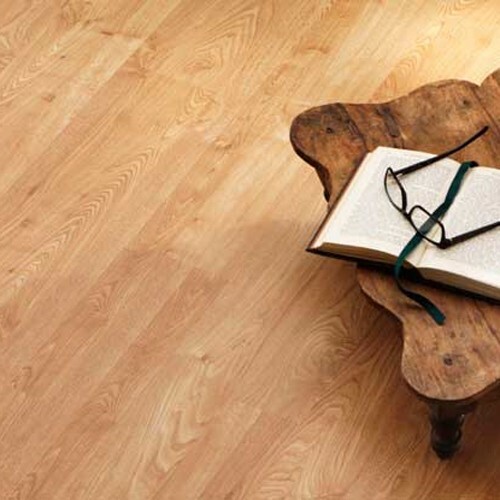 An almost cream colour, the flooring is suitable for most rooms in the home or place of residence.